Our new challenge this week has a Summer theme. 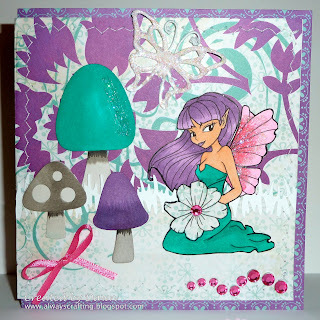 So please go over to the Crafting for all Seasons blog and enter your project then check out the lovely cards created by the Design Team using images from our sponsor for this challenge The Greeting Farm. I really love this image. The fairy just is drawn so beautifully. She was a joy to color. You can get this image HERE. Oh my goodness! I can't believe I won! Thanks so much, I'll look forward to hearing from you! OH this is so pretty, love the toadstools & the colour combo is just great! Thank you for sharing with us over at Craft Your Passion, good luck! Wow, those colors are AWESOME! I love those rhinestones. Plus, you picked super past challenges for your Tuesday Throwdown entries. Thanks for playing along with our Anniversary challenge this week!! Adorable card! Thanks for joining us at Tuesday Throwdown!